Johnny Gun His Gun is a novel that asks this question through the tragedy of World War I soldier Joe Bonham. Fighting in Europe, Joe steps on a land mine and is blown to pieces—almost. When he comes to consciousness afterward, in a hospital, he doesn’t know how much time has passed. He figures that it could be a year. What he does slowly discover is that he is deaf from the blast. And that he is mute and unable to smell, having lost the features of his face in the blast. And that he has no arms. And no legs. They may have survived the blast, but then were amputated to stop infection. Otherwise, why would the doctors have worked to save him? He is isolated, with tubes into his lungs and stomach for air and nourishment. Unable to communicate with others, Joe’s world consists of waiting for the nurse to bathe him. In order not to lose his mind, he times the visits to get an idea of the passing days. He detects daytime by the warmth he feels. He thinks back on many of the very ordinary incidents of his life—his first true love, fishing with his dad, goofing around with his friends, working hard in a commercial bakery. Contrasted with his current situation, these events take on an indescribable beauty. Joe knows that his suffering is a fate worse than death. But why? The war seems meaningless. Words like ‘freedom’ and ‘liberty’ are intangible. And he certainly has neither now. His youth, his freedom, his happiness, and his future were all taken by war generals and older (upper class) men who are happy to take young (lower class) men’s lives for indistinct causes. At one point, Joe realizes that he is being given a medal—he can feel it being pinned to his garment. He tries desperately to twist and throw off the mask covering his face. He wants others to see the reality of war, to forget the sentimental parades and hero stories. Joe comes to understand that the only thing remaining for him to do is to be a proof of the ugly reality of war, to make others think about the true damage war inflicts. His years’ long effort to be able to communicate this are heroic. The result of his efforts are tragic. 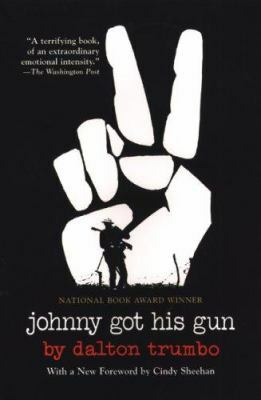 High school housekeeping: Johnny Got His Gun is something of a cult classic as well as a critically-acclaimed anti-war book. It was published in 1939, on the cusp of World War II, but has remained a favorite ever since. If you find a new imprint, you’ll see that it has several introductions, including those from war protestors of both the Vietnam War and the more recent Iraq War. I happen to be thinking about it now because I was book talking to students on books that have some connection to events in history. In going over Johnny again, I was reminded of its power to move the reader, to make her question conventional wisdom. The story of the author is also a powerful cautionary tale on censorship. Though Trumbo agreed that the book shouldn’t be published during World War II (he distinguished WW II from WW I, which he thought of as a ‘romantic war’), in the later McCarthy era, Trumbo was called to testify before the House Committee on Un-American Activities. (He had been a member of the Communist party.) He was one of the ‘Hollywood Ten’ who refused to give information on other suspects. He was blacklisted from the film industry and spent a year in jail. For many good reasons—not the least of which is its teen appeal—this is a book you shouldn’t miss. This entry was posted in "Banned Book", Classic Fiction, Controversial Issue/Debate, Fiction, Historical Fiction/Historical Element and tagged Adult books for teens, anti-war books, book reviews, classic fiction, Dalton Trumbo, Johnny Got His Gun, war, World War I. Bookmark the permalink. Found a thoughtful straight forward review on “Johnny Got His Gun” – not a typical book recommended for Teenages, but Ms Waddle at School Library Lady Reviews gives it a well thought-out review. If you haven’t read the book. I recommend it eventually.